What are the Federalist Papers and other founding documents? There were other written documents that were involved in the founding of the United States Of America, and until I reached a ripe old age I did not even KNOW they existed! See what I mean, I really didn’t know that stuff. Here are some links to informatinon on these additional documents. I will add any valuable links to this article as I find them. Most were found from a Google search. I firmly believe these documents tell what was in the minds of those that wrote our founding documents. After all, they did write them, and they did it without a ball point pen or a computer. The Federalist Papers are a series of 85 articles and essays written by Alexander Hamilton, James Madison, and John Jay promoting the ratification of the United States Constitution. Seventy-seven were published serially in The Independent Journal and The New York Packet between October of 1787 and August 1788. A compilation of these and eight others, called The Federalist; or, The New Constitution, was published in two volumes in 1788 by J. and A. McLean. 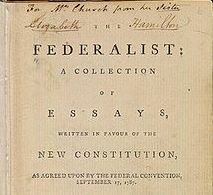 The series’ correct title is The Federalist; the title The Federalist Papers did not emerge until the twentieth century.